Guozhuang village is in Qamdo Prefecture, in the east part of Tibet autonomous region. Guozhuang's bonfire dance is the most famous folk dance in Tibet. At the Tiananmen Rostrum, there hangs high a portrait of former chairman Mao Zedong. Wang Qizhi is the man who used to paint the portrait of the leader. For most westerners, the word 'calligraphy' simply brings to mind pretty letters on a page. 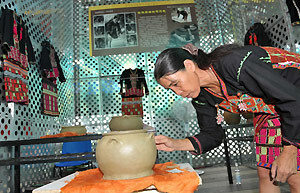 But for the Chinese, it's a highly prestigious art form, and an important aspect of the country's culture. Wang Gaosheng is a postgraduate major in Chinese calligraphy theory now studying at the Institute of China Calligraphy Culture, Capital Normal University. Yang's work has the rich flavor of traditional Chinese painting, also the deep meaning of folk culture. She hopes to share her life experience and express her well wishes through her work. In Beijing, there is a man on the roadside of Houhai, sitting silently and concentrating on writing things on rice every day. His name is Zheng Liang. Many people like Peking Opera because they are fascinated by the costumes and make-up of the different characters. 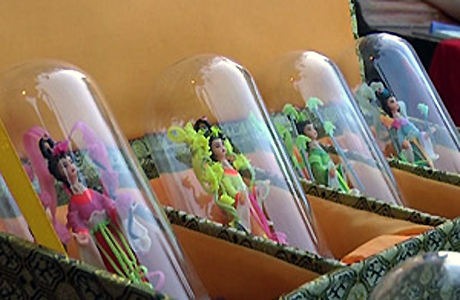 The characters are often reproduced as bristle figurines, a well-known Beijing folk art. Liuli artwork is among many of the traditional Chinese handicrafts, and it has more than 600 years of history. It can also be found on the Intangible Cultural Heritage list. The cuoqin dates back 4,000 years but would have largely been forgotten today except for the efforts of one man. 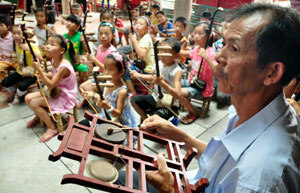 Instead of a traditional art only old men like, Peking Opera is becoming a hobby for young men and women these days. The Chinese traditional medical treatment of acupuncture or piercing the body with a needle is a treatment which focuses on the inside from the outside. Scraping is a technique which developed from traditional Chinese medicine theory. The earliest tool was a special kind of stone "bian shi". Zhen jiu is a therapy that combines both acupuncture-the inserting and manipulating of needles into pressure points-and moxibustion.